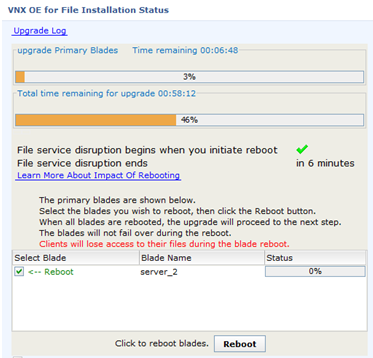 Here I will detail the steps involved in upgrading the OE for file and block on the VNX. Using the Unisphere Service Manager is the recommended method of upgrade. The USM now supports an upgrade if the VNX has two Control stations provided you are running a minimum code level of 7.0.50.x. Note that VG2 and VG8 systems must continue to use the CLI procedure for upgrading. b.	x.x.x.x_emcnas_CD1.iso and x.x.x.x_emcnas_CD1.iso.checksum (if available). –	The DVD iso image cannot be used. –	If you do not have the expected checksum file, Unisphere Service Manager (USM) will warn that it cannot validate the software file and that it may be corrupt. If you are sure that your files were downloaded correctly, you can ignore this message. Note:	The “.upg” is required for the folder name. b. Any enablers that you are to install. •	Upgrade the VNX OE for File software before upgrading the VNX OE for Block software Start Unisphere Service Manager. Log in to the storage system to be updated using the IP address of one of the SPs and administrator credentials. Run the Prepare for Installation step to check for any issues, and address them. During the File software upgrade, you will be asked if you want to reboot the data Movers during the upgrade or after the upgrade. Did the File OE upgrade complete successfully?